Talking Trends: From Passé to Present! We recently hosted our first (and very successful!) #WeddingWednesday event, bringing together brides from Boston and beyond to talk trends! For the next few weeks, I am really excited to highlight some of the top trends we are seeing, especially the trends that have re-emerged and been restyled to be fashionable and fabulous for 2017 and beyond, going from passé to present! For years, cheese displays have been pushed aside for more chic and stylish plates and bites. As the movement in food goes more into fresh, locally sourced and regional varieties, Cheese is now Chic again! We are especially lucky here in New England, with all of the fresh, local, and delicious resources regionally! This is also a stylish way to add more to the story of your wedding day, whether you are featuring favorites that are significant to you as a couple, and can include varieties from favorite first dates, to those experienced on special vacations. Additionally, this is a great way to incorporate an added experience for your guests by including pairings and unique offerings to give them exposure and even a little education during your cocktail hour! Tips to achieve this, look at what is local (within a 50-75 mile radius is always optimal!) and what can most relevantly with the season. 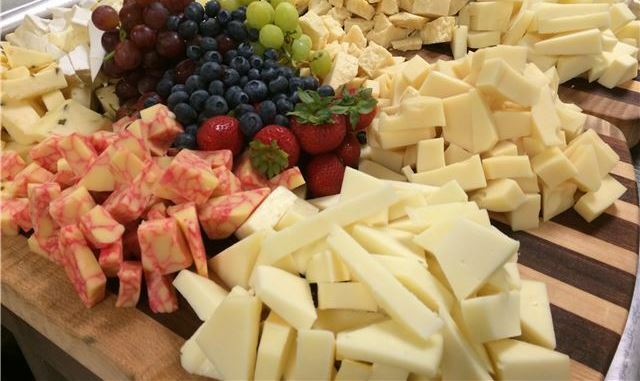 For example, a Peppered Strawberry Compote with a Goat Cheese makes sense in June, while a Sharp Cheddar is perfect when Macintosh Apples are at their best in September!